The Tällberg Forum is a gathering like no other. For over 30 years, leaders have come at the invitation of the Tällberg Foundation, to talk about what is going on in the world. Everyone brings her/his own experience to the talks. In one sense, we can view this as one single, continuous conversation. Participants have varied. The themes have evolved and the times have moved on. But some things remain constant: the culture of the village that hosts us has not altered much. The landscape and the lake are the same, even though the local biosphere is shifting perceptibly now, (mainly due to climate change). But the underlying Tällberg approach has not changed. Conversations at Tällberg have been, and continue to be, based on systems thinking, humanistic values and on an unrelenting curiosity and desire to have one’s reasoning, assumptions and world views shaken. In 2012, we are highlighting the decisive role of technology and its evolution. We believe that technology shapes the present and the future more profoundly than say, economic policy. It is not possible to design longer term political and economic agendas if we do not understand the dynamics of science and the evolution of technologies. The Tällberg Forum begun June 14 and as stated this year’s theme is the significance for the future of technology. First, we have the fact that new technology can, in reality, be coupled to people so that people can use their thoughts to control it as well as the frightening thought that technology can control people. At the same time we can use new technology to scan the human body and study its every internal detail without opening it. I have many interesting lectures to attend. We have now all had a communal dinner and I have found some private time to prepare tomorrow’s lecture on “The Global Energy Future”. Before me a representative from Shell will tell his tale. Then Amory Lovins, who was in Uppsala yesterday, will describe how we can save energy and after that I will speak to review the future that they present. When I went to my hotel at 11 PM there was still daylight in Tällberg and in the picture you can see the tent that is the central arena for the forum. Day two began with a film on ecological systems thinking. Nora Bateson presented the film on her father Gregory Bateson. The importance of communication was emphasized and it was a poetic film with fine quotations in English. The fact that English is the language for today’s conference makes it much more difficult for people with other mother tongues to formulate and express their ideas. It was just this that made me hesitant to write a book about Peak Oil in English but the fact that Michael Lardelli translated my Swedish thoughts gave the book another dimension. The conclusion is that we citizens of the world do not all have the opportunity to communicate on equal terms. For me, the day’s high point was the symposium on “The Global Energy Future – where new technology is not enough”. Peter Anderberg reviewed the issues that people interested in energy face and the idea was that these issues would then be illuminated by various experts. Gert Jan Kramer is responsible for the oil company Shell’s future scenarios that extend to 2050. 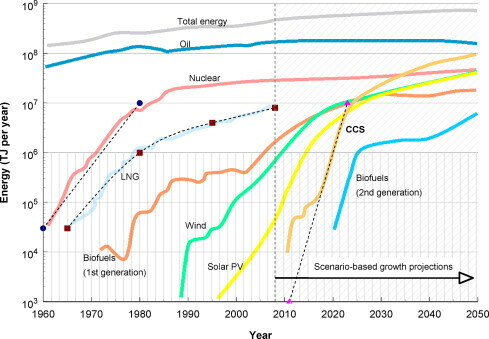 In an article in Nature in 2009 titled, “No quick switch to low-carbon energy” he, together with Martin Haigh, presented the scenarios in the figure below. The idea behind the article was to discuss non-fossil fuel scenarios but Shell’s future oil scenario exists as a reference level. The anticipated exponential growth of alternatives should be reviewed since these appear unrealistic but that will be a task for the future. For Shell’s oil scenario, (that was not discussed), I can, however, comment. The scale is logarithmic so it is difficult to see that there is a small increase before production then returns to today’s level. For simplicity we can say that production is constant at 30 billion barrels (Gb) per year from 2010 to 2050. This amounts to 1,200 Gb and is of the same order of magnitude as the world’s entire oil reserves (according to BP) of 1,500 Gb. Of course, I regard that scenario as wishful thinking. Amory Lovins repeated the presentation he gave in Uppsala. In his new book “Reinventing Fire” he describes how the USA can become completely self-reliant for energy. My research group has not studied how realistic the calculations are but they appear very interesting. Jochen Mannhart from the Max Planck Institute in Germany explained how important basic (pure) research is for understanding our future energy supply. I got to close the symposium and I chose to describe oil’s future. Of course, I explained that Shell’s future scenarios are not consistent with the reality that I see ahead. I also discussed shale oil production and how unrealistic it is as a part of future scenarios. The Tällberg Forum consists of a variety of plenary activities in the forum’s tent as well as larger symposia and smaller sessions. The plenary activities are always framed by cultural activities and yesterday’s discussion on trust was introduced and concluded by beautiful tones from Svante Henryson’s cello. An experience that cannot be described in words but must simply be experienced. Svante’s music led into Emma Tranströmer’s reading of Nobel prizewinner Tomas Tranströmer’s poem on “Trust”. Alan Stoga from the USA moderated the discussion on trust extremely well. I suggest that you should also listen to his description of who we trust and the discussion that followed. (Follow this link to a website with recordings including that on Trust and that also includes the cultural contribution). From the morning’s eight “Smaller Sessions” I chose “Shifting energy into balance”. The discussion addressed ”What will it take to unlock the potential of technology in the search for clean, safe and ubiquitous power?”. We walked through the rain to the hotel Dalecarlia for the discussion and it was a group of 25 participants who examined this important question. In the group was, among others, County Governor of County Administative Board of Dalarna and the secretary of the Social Democratic Party. A central issue was how various nations had stimulated construction of wind power infrastructure. Amory Lovins also participated in the discussion and again advanced his optimistic view of the changes in the USA. I asserted that rapid growth is only possible for smaller systems but the systems needed to realize Amory’s dream can, in my opinion, not be instituted rapidly. The evening offered cultural events. There was a small concert with Emma Tranströmer and Svante Henryson but the high point was the large concert in the tent to which the public was invited. Once back in the hotel some of us sat and discussed the world’s problems. Included in that discussion was Jan Eliasson who on 1 July will assume the role of the UN’s deputy general secretary. Since that part of the conversation was of a private nature I do not want to describe it but before we knew it the time was 2 AM. Jan Eliasson has previously heard several of my presentations on Peak Oil and it seemed natural to give him a copy of my book Peeking at Peak Oil. He was clearly interested and planned to read the book. It was in 2005 that the Tällberg Forum expanded to its current size of 400 to 450 delegates from all over the world. Over the years a total of 70 nations have been represented. This year there were representatives from 45 nations. The overall theme during these years of the Tällberg Forum has been “How on earth can we live together?” This year’s title addressed mainly technology. I intentionally chose to participate in those activities concerning energy and various technological aspects of energy but I also attended a symposium on nanotechnology. Sunday’s symposium, “The future of human well-being – global threats and hope” was actually suggested by me and I looked forward to the discussion. Unfortunately, not so many people attended the symposium because the venue for it was Dalecarlia, a hotel farthest from the tent and when it was time to walk there it rained heavily. The fact that many had already packed up and were leaving Tällberg was also a reason for the limited attendance. I began by giving a shorter version of my presentation from Uppsala and then the approximately 15 attendees had a discussion. At first we discussed the main questions and this evolved into a discussion about the conditions for the world’s poorest inhabitants. One conclusion was that securing the world’s food production in a fossil-free manner was the most important issue for the “well-being” of the world’s population.